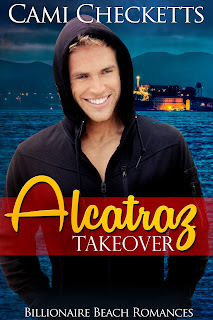 The latest Billionaire Beach Romance, Alcatraz Takeover, by bestselling sweet romance author, Cami Checketts, is out and available on Amazon. The book can be read on its own if you haven't had a chance to read the other Billionaire Beach Romances. When Athena Haddad's father and brother are killed, she busies herself working at her wellness studio and helping her mom fight MS. Little does she realize how flat her life has become--until she meets Nixon Browning. The billionaire is expanding his chain of health stores along the west coast, but he doesn't appreciate her beautiful city and she thinks his products are over-priced and worthless. Athena sets out to teach Nixon about the city and its history while ignoring his inherent kindness, sharp intellect, and the warmth that spreads through her body when he touches her. Nixon is determined to help her mom battle MS no matter what Athena thinks of his vitamins. In an unexpected turn of events, their tour of Alcatraz becomes a fight for their lives, forcing them to let go of their pride and work together. If they can survive The Rock, they may be able to bring life and color to the sparks of romance between them.